On your arrival at the Hyderabad Airport/Railway station, get welcomed and assisted by the representative and transferred to your hotel. Check in and freshen up. After taking a little rest, if time permits, explore the nearby attractions. You may enjoy gradual walks down the streets, communicate with the locals or enjoy street food. Return to your hotel for an overnight stay. In the morning, after breakfast, get ready to visit some of the architectural heritage sites of Hyderabad. Enjoy guided tour to the royal Tombs of the Qutb Shahi Kings and the magnificent Golkonda Fort. Thereafter, visit Nizams Museums, Birla Temple, etc. Evening is free to be spent at leisure. You may explore the local markets and buy artifacts as souvenirs. Later return to your hotel for dinner and an overnight stay. Early morning, after breakfast, get ready to explore other tourist attractions. Visit the biggest ‘One Man Collection’ - Salarjung Museum. Here, at this national museum, you may find paintings, ceramics, sculptures, metallic artifacts, carvings, manuscripts, clocks, carpets, and textiles. Additionally, a huge collection of furniture from Persia, Japan, Europe, Burma, North America, China, Egypt, and Nepal, are pleasurable to watch. Later, you may proceed to the second biggest Mosque of India, Charminar, also popular as The Arc de Triomphe of the east. Return to your hotel for an overnight stay. Post breakfast, drive to Warangal. 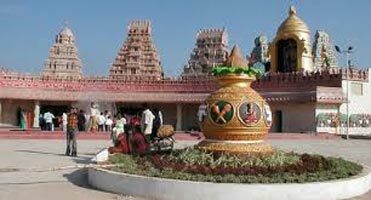 En route, visit Pembarti Village for its Brass making, the carpet weaving center and Kulpakji (Kolanupaka) for the 2000 years Jain Temple. On your arrival at hotel in Warangal, check in, freshen up and take a little rest. You may use the remaining hours of the day to explore the nearby attractions. Dinner and an overnight stay at your hotel. Early in the morning, after breakfast, visit the 1000 Pillar Temple, Ramappa Temple. In this temple, there are sculpted figures drawn on the wall panels, ceiling and pillars, all inspired from Hindu mythology. Also visit various mud-brick forts that today are in ruins. Thereafter, drive to Vijayawada. On your arrival at Vijayawada hotel, check in and halt for an overnight stay. In the morning, after breakfast, enjoy guided tour to Kondapali Village and explore the unique wooden Toys. Thereafter, visit Kanaka Durga Temple. Here, at this ancient living temple, you may find inscriptions of different dynasties. Later in the afternoon, visit a finest testimonial of ancient Vishwakarma Sthapathis, Undavalli Caves. After a full day excursion, return to your hotel for dinner and an overnight stay. Post breakfast, drive to Nagarjuna Sagar. On your arrival at hotel in Nagarjuna Sagar, check in and take a little rest. Later, in the afternoon, visit the Nagarjuna Konda and Anupu - the Amphitheatre. Also pay a visit to various other Buddhist remains in the area. Return to your hotel for dinner and halt for an overnight stay. After breakfast at hotel, drive to Srisailam. Reach your hotel, check in and take a little rest. Later in the evening, visit Mallikarjuna Temple. This is one of the twelve Jyotir Lingam temples of India. This temple is nestled in the Jungles of Nallamala. After excursion, return to your hotel. If time permits, you may also take gradual walks down the streets and communicate with the locals. Dinner and an overnight stay at you hotel. In the morning, after breakfast, drive to Kurnool. Reach your hotel, check in and take a little rest. Later in the afternoon visit the magnificent 7th century Chalukyan Nava Bramha temples. Later proceed to the wonderful museum at Alampur. Return to your hotel for dinner and an overnight stay. Early morning, after breakfast, drive to Puttaparthy (Puttaparthi). Check in at your hotel in Puttaparthy. Freshen up and take a little rest. Later in the afternoon, visit Vijayanagar temple and the great Nandi at Lepakshi. Also visit the impressive Fort ruins at Penugonda. Return to your hotel and if time permits, communicate with the locals. Dinner and an overnight stay at your hotel. This day is fully dedicated for excursion to Puttaparthy Prasanthi Nilayam. This is the main ashram of Sri Sathya Sai Baba. The ashram was established 40 years ago. Here you may attend the early morning prayers and later explore the attractions of the ashram. You may also attend evening prayers. Later return to your hotel for an overnight stay. Early morning, get ready for a full day excursion to Tirupathi (Tirupati). 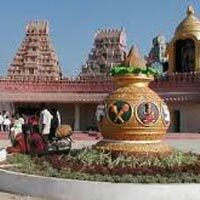 Visit the Govindaraju temple, Padmavati temple and Lord Venkateswara temples. Thereafter, reach to your hotel, check in and take a little rest. You may also use the remaining hours taking gradual walks down the streets and visiting nearby attractions. Dinner and an overnight stay at your hotel. In the morning, after breakfast, get transferred to the Chennai hotel. Check in and freshen up. You may use the remaining hours for sightseeing in Chennai. Later get assisted and transferred to Chennai Airport/Railway station to board the flight/train towards your onward journey.